Campbell University activated its severe weather and emergency policy on Wednesday in preparation of Hurricane Florence, the massive Category 2 hurricane whose effects were being felt in Buies Creek as early as Thursday afternoon. Campbell has canceled all classes and suspended normal operations on its main campus — as well as its Raleigh, Fort Bragg and Camp Lejeune campuses — through Sunday. Decisions will be made regarding Monday’s operations over the weekend. 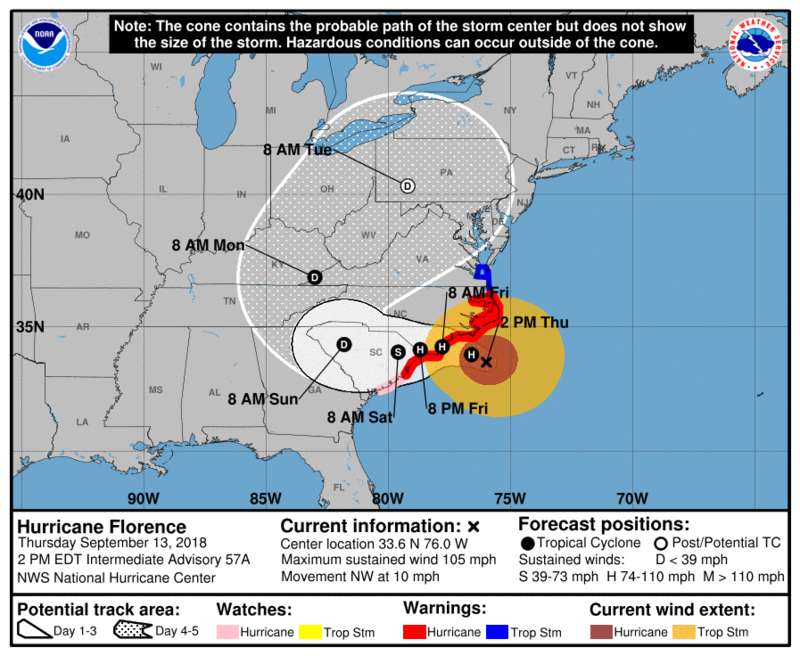 According to the National Hurricane Center, Hurricane Florence is expected to make landfall early Friday as a Category 2 storm (winds as high as 110 mph). Dangerous winds (55 mph and higher) may arrive near Buies Creek overnight and into Friday morning. The greatest threats to Campbell University’s campus are flooding and power outages. The National Weather Service predicts anywhere between 7 and 15 inches of rain in Harnett County Friday and Saturday. Some forecasts go even higher. Campus personnel have been working vigilantly this week to protect buildings in low-lying areas that are susceptible to flooding. 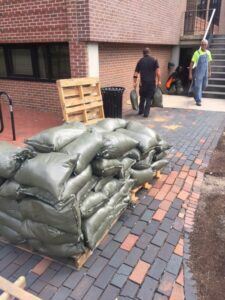 Sandbags and other protective barriers have been placed throughout campus. More than 300 residential students have informed University officials that they will remain on campus through the storm. 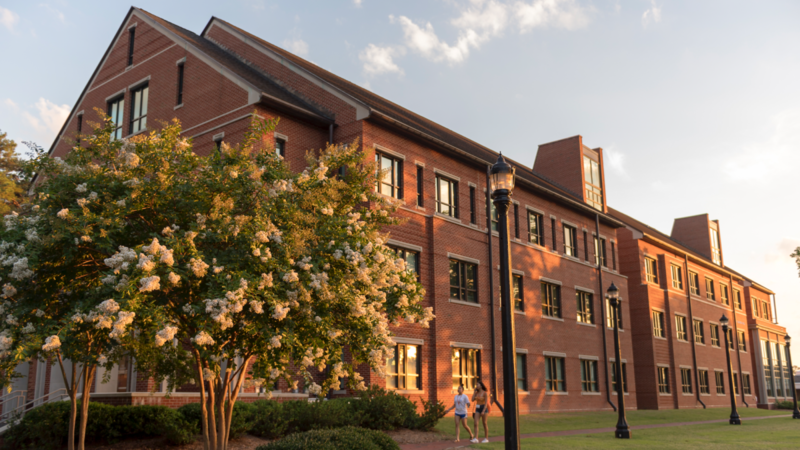 Harnett County Sheriff’s deputies, emergency personnel and residential directors for all 11 on-campus residence halls and apartments are also on campus to ensure the safety of those who remain. Marshbanks Hall will remain open until 8 p.m. tonight to provide food services for those on campus. Marshbanks will not be open Friday to prevent students from venturing out into dangerous conditions. Instead, the kitchen is providing students with food to take to their dorms to wait out the worst of the storm. Marshbanks will reconvene food services at 9 a.m. on Saturday. Harnett County declared a State of Emergency on Wednesday. The county will open two emergency shelters beginning at 8 p.m. Thursday. Shelters will be located at Triton High School at 215 Maynard Lake Road in Erwin, and at Overhills High School at 2495 Ray Road in Spring Lake. Anyone staying at a shelter should bring any required medication. The Triton shelter will have provisions for pets. The county is planning to open its Emergency Operations Center around 6 p.m. Thursday. After that point, personnel can be reached on the PIO lines at (910) 893-0630 and (910) 893-0634. Until then, the main line at Harnett County Emergency Services is (910) 893-7580.